What does that mean to the everyday user? Not much. Most household electrical devices will run perfectly fine on either type of wave form. 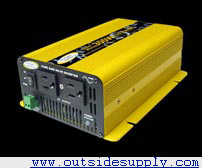 Most of our customers who are using a power inverter to run a laptop, a/c cell phone charger, fan, or camera find that a modified-sine wave power inverter that operates through the cigarette lighter socket the easiest to use. 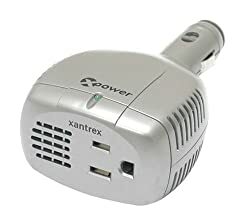 We usually suggest choosing power inverters that are rated under 300 watts when using the 12-volt cigarette lighter socket found in most vehicles. We suggest this because after reaching 300 watts of draw on the inverter, the fuses in your car will begin to blow. The xPower 175 Micro (about $35.00) is a great choice for dashboarders who would like an easy solution to power their devices. It has only one outlet, but since plugging it into a 12-volt socket is all that is required for operation, it can't be beat for ease of use. 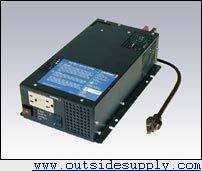 This little inverter can supply 140 watts of continuous operation and has a built-in surge protector. 300 watts ($40-$60): For household appliances, TVs (up to 27"), VCR, desktop computers, other mobile office equipment. Most of these connect via a 12-Volt plug. There are a few other applications -- high-end audio video units, plasma displays, gaming systems, and certain scientific testing equipment -- for which true-sine wave is not usually required. Even so, these applications can usually benefit from the improved clarity of the electrical signal produced by a true-sine wave power inverter. Users of these particular items have usually spent a lot of money to achieve optimal results from their equipment, and it would be a shame to have a cheaper modified-sine wave signal cause inaccurate readings on a piece of scientific equipment. It would be equally disheartening to have small distortion lines appear on a $3000 plasma TV because the user saved $250.00 by buying a modified-sine wave power inverter. It is also important to understand that there is no way to upgrade or clean a modified-sine wave signal. If your item does not work on a modified-sine wave inverter, you will need to purchase a new true-sine wave power inverter. We often recommend that users on a tight budget purchase only enough true-sine wave power to run required equipment and purchase a less expensive modified-sine wave inverter to run the rest of the load. The Xantrex XS400 ($375-$400), a true-sine wave power inverter, is often used to power only the audio video loads in RV applications. The rest of the RV's electrical loads are often powered by a larger modified-sine wave power inverter. Many people are surprised at the overall improvement in signal quality when using inverters on audio/video applications. They notice that there are fewer distortions and few if any interference lines. While we don't recommend true-sine wave inverters to most of our customers, we do advise customers with no budgetary concerns to choose a true-sine wave product. They can then rest assured that their inverter will be able to handle anything they plug into it. Many stores do not carry true-sine wave power inverters because the price is often significantly higher than their modified-sine cousins -- usually two to five times more. 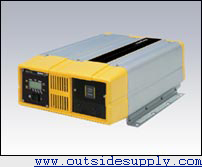 Generally, expect to pay $200 to $3,000 for pure-sine wave inverters depending upon how many output watts are needed. Our firm, Outside Supply has had great experience with two brands of true-sine wave power inverters, namely the Xantrex Prosine line and the Go Power! true-sine wave line.